LAS VEGAS – Amazon Web Services launched dozens of new services to its cloud platform over the week at its annual re:Invent conference, ranging from new methods to train machine learning algorithms, to accessing satellite data feeds, to replacing your archives of tape storage. Customers that took in the keynotes and myriad sessions and workshops were left to try and absorb what might be useful to them. To help, we spoke to AWS customers and partners attending the mega-conference about the potential they see for some of the most buzz-worthy announcements. A dashboard displaying social media stats ahead of a keynote showed that Firecracker was by far the most mentioned new product at re:Invent. A virtualization technology that allows users to launch lightweight micro-virtual machines in non-virtualized environments. It’s the technology underlying AWS Lambda that uses kernel-based virtual machines, and as explained by AWS evangelist Jeff Barr, it offers the security and isolation of a virtual machine with the efficiency of containers. “Firecracker says let’s build a purpose-built environment that makes it really easy for us to run my functions your functions somebody else’s functions on the same hardware in a very very strictly isolated environment where they can interact with each other they can’t interfere with each other in any way so we have the high level of isolation we have the really fast time to build a startup the these virtual environments,” he says in an interview. Previously, developers that wanted to work in such a way would have to make use of an entire server. With Firecracker, AWS customers can use just the minimum amount of resources to run their code, and enjoy the same benefits. That includes a good security posture, due to the minimal attack surface exposed. With such capabilities, there are more potential building opportunities for developers, explains Tolga Tarhan, chief technology officer at Onica, a premier AWS consulting partner. AWS has released Firecracker to open source with an Apache 2.0 licence. At time of writing, there are 23 contributors committing code to the project. For Athabasca University CIO Jennifer Schaeffer, Firecracker presents an opportunity to better connect legacy architecture with AWS cloud deployments among other benefits. 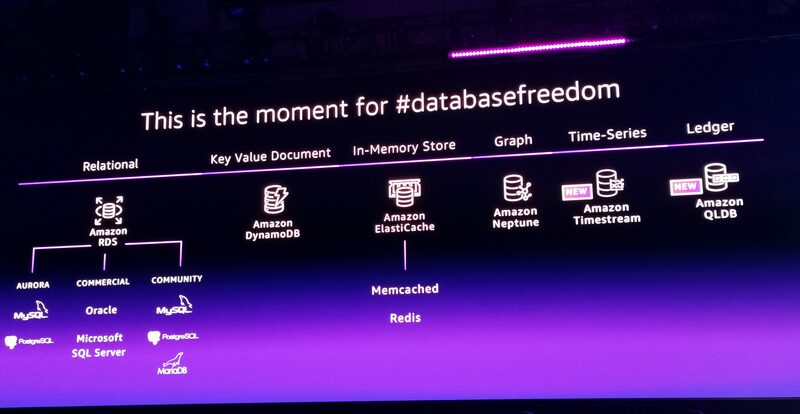 AWS launched several new database services at re:Invent, including some of the blockchain variety. But one that was getting attention among attendees was Amazon Time Stream. Designed for Internet of Things (IoT) devices and the time-series data often associated with them. This data arrives in time-order form, is always append-only, and the queries on the data are always over a time interval. AWS says that Time Stream can process trillions of events per day, at speeds 1,000 times faster and at one-tenth the cost of relational databases. It does this by organizing data in time intervals, and using different processing tiers for different operations. The claims were made on stage during a keynote by AWS CEO Andy Jassy. He also equated having a variety of choices of database services to freedom. AWS approaches databases with the idea that you should choose the right tool for the right job. In the midst of moving several relational databases, Schaeffer sees the value of the Time Stream database. There have been other ways developers have figured out how to store time-series data, Onica’s Tarhan says. But this offers a first-class database to solve the problem. Further to services related to IoT, the AWS Device Qualification Program and AWS Partner Device Catalog were introduced by Terry Wise, vice-president of global alliances and channels at AWS. It ties into the already-existing AWS IoT device tester and aims to make it easier and faster for partners to validate their own hardware. “Customers are saying ‘hey make it easier for us to find well-vetted devices that pre-integrate with the AWS cloud,” he says. The catalog is live and already features a range of devices, from full rack servers to developer kits for AI vision. 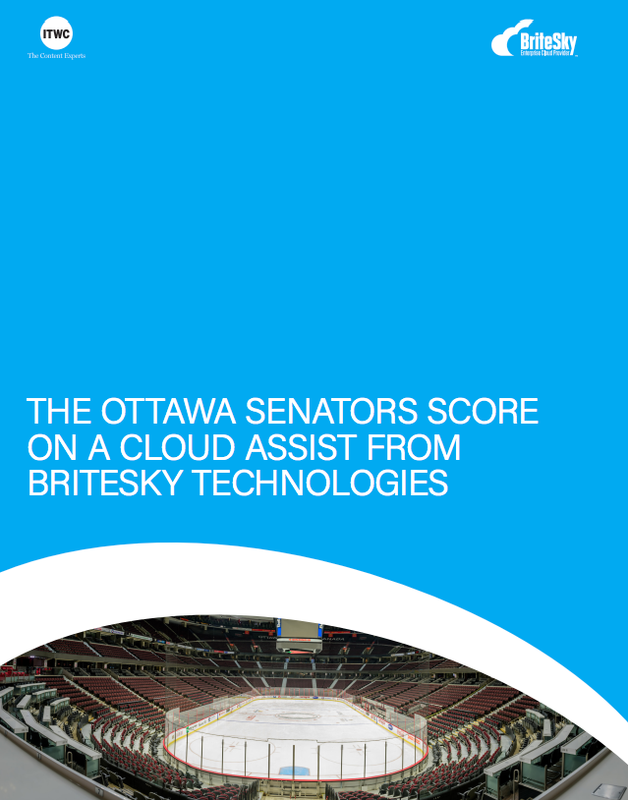 Kitchener, Ont.-based Miovision is a firm developer smart city solutions that bring together various IoT devices. For example, it’s TrafficLink hardware connects with traffic light controls in an intersection to collect data about what’s happening in the intersection and provide connected control over the lights. In building such solutions, John Price, technical lead at Miovision, says the firm does a lot of manual searching for IoT devices. But the growing market is making that more challenging. Since Miovision builds on the AWS platform, it prefers hardware that is already integrated with it. It has the capability to build that out itself if necessary, but now with a quick look at the AWS directory, they could save themselves some work.